The NFL already has some stupid rules so why not add some more asks Steven O’Rourke. 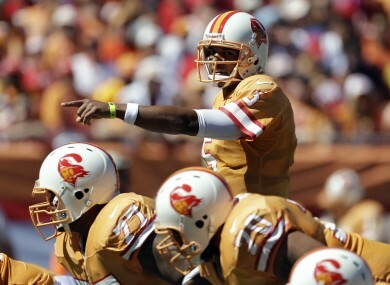 Tampa Bay Buccaneers quarterback Josh Freeman calls the play. I HAVE ALREADY written at great length about how the “Tuck Rule” is one of the most ridiculous rules in all of sport, though, it must be said, the Raiders actually benefited from it this weekend. However, Sunday night, during the Tampa Bay Buccaneers attempted comeback against the New Orleans Saints, we saw another example of a law that has no place in the NFL Rule Book. With no time left on the clock, and down by seven points, it looked like Bucs’ quarterback Josh Freeman had tied the game when he found Mike Williams at the back of the endzone. As the Tampa fans went crazy, an official threw a little yellow flag. Williams had been shoved out of bounds by Saints defensive back Corey White before coming back onto the field to catch Freeman’s pass. According to NFL rules, there was nothing wrong with White pushing Williams as Josh Freeman was out of the pocket meaning all the Tampa receivers were considered blockers and making all contact with them legal. What I don’t like about the rule is that the player was forced out of bounds. Had he ran out of his own choosing, I can understand why he wouldn’t be allowed touch the ball next but, when a player is forced out, it seems counter-intuitive that he can’t come back in. Because of this rule, once Freeman left the pocket the Saints could have legally forced all the Tampa receivers out of bounds leaving the quarterback with nobody to throw to. Does that seem right? But, you know, it’s easy to complain about these things without suggesting any alternatives; so here are five rules I think the NFL should add to make games more interesting. As it stands, after a touchdown, teams can go for a virtually automatic one-point conversion or the more difficult two point conversion, both from two yard line. I propose changing the latter to a three point conversion where the ball is placed at the 10-yard line. Teams can run or pass the ball into the endzone as the currently do on a two-point conversion. By giving teams the chance to make a touchdown worth nine points, especially in close games, we might see more turning down the kicking option and could well force more aggressive play-calling during the rest of the game. It really annoys me that a 30-yard field goal, which is basically a chip shot, is worth half an unconverted touchdown. The difficulty involved of getting the ball into the endzone is much more than double a kick from that distance. My suggestion is that a kick inside the 10-yard line is worth one point, 10-19 worth two, 20-29 worth three, etc, etc. By adopting the fantasy football approach of alternating the value of field goals, you force teams to go for it on fourth down more often than kicking it. This not only makes for more exiting encounters but probably means the San Francisco 49ers will never win another game. At the moment, the result of defensive pass interference is an automatic first down at the spot of the foul while offensive pass interference sees the offence lose ten yards from the previous spot. My new proposal is that the down is replayed from the same spot but the offending team is reduced by one player for the next play. So many teams — I’m looking at you Seattle Seahawks — seem to specialise in committing so much pass interference that the referees can’t possibly penalise it on every play. Losing a player for a down will lead to smarter, fairer, defending and a better chance of big offensive plays. When you hit Tom Brady on the helmet with your arm it’s a 15-yard penalty. Do the same to Danny Woodhead and nobody cares. Dive at Matt Schaub’s knee, 15-yard penalty. Do the same to Brian Cushing, ending his season, and no penalty is called. I get that quarterbacks are the face of the franchise and they make teams lots of money but they’ve become so untouchable that they may as well be playing a different sport. By allowing quarterbacks be hit the same way as other players, you go some way to reducing the favouritism that currently exists towards offences in the NFL. Remember when FIFA introduced the Golden Goal to encourage teams to be more attacking in extra-time? The effect was the exact opposite with teams adopting a walking-on-eggshells approach in the hope of not losing rather than going for the win. That’s what overtime in the NFL is like. I suggest a variation on the NCAA system where, when a game goes to overtime, each team is given one possession from its opponent’s twenty-five yard line. The team leading after both possessions is the winner. If the teams remain tied, the game continues with possessions alternating until one team leads the other at the end of a series of two possessions. Surely that’s much more exciting than seeing a team kick a 30-yard field goal to win in overtime? Are these stupid suggestions? Maybe, but no more stupid than some of the laws you can currently find in the NFL Rule Book. Email “The Redzone: Proposing some new rules for the NFL ”. Feedback on “The Redzone: Proposing some new rules for the NFL ”.